Corn tortillas are a round, thin, unleavened bread made with coarse masa flour (ground, dried and sifted masa dough) or “flourless” fresh masa made from corn that has been treated with lime in a process called nixtamalization. Due to their large surface area and small thickness, tortillas are baked in high temperature ovens for a very short time. Corn tortillas are not mixed the same way as flour tortillas or leavened, given their lack of gluten-forming proteins. In the United States and other parts of the world, dry masa flour is the preferred way to produce tortillas. According to U.S. data, corn tortillas have a smaller market share than wheat flour tortillas. They have not grown as fast as flour tortillas in the U.S., presumably due to their limited shelf-life. The obtained nixtamal is then discharged into a stone grinder to form a plastic and cohesive dough or masa. Some bakers produce corn tortillas directly from coarsely ground corn blends (direct method). Formula adjustments must be done as water is needed to “reconstitute” the masa dough. In both fresh or dry masa, functional ingredients are added during mixing. * US 40-mesh sieve (screen size 0.016 in). ** Lime must be suitable for use in food and comply with local food legislation. 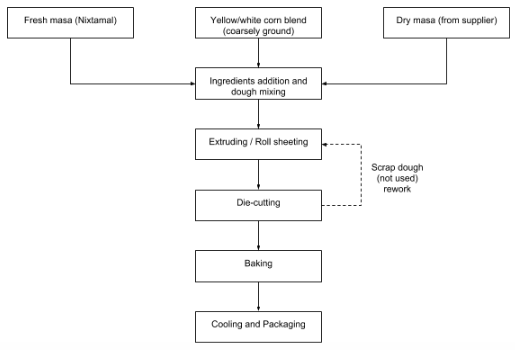 The following block diagram shows the production steps (according to the corn starting material) that is needed to produce corn tortilla. Mixing: Mix time is 2–3 min (only incorporation and hydration of dry ingredients is needed). Water is needed when using dry masa or corn blend (not in fresh masa as it is already hydrated). Lime is added when using corn grits or corn meal blends (not nixtamalized). Cutting: Corn tortillas are typically smaller and less thick than their flour counterparts (10–15 cm in diameter). Cooling: Product is cooled to less than 32°C for 2–5 minutes on cooling conveyors before counting, placing and stacking into plastic bags for distribution. The kneading of masa dough must be carried out at low rotational speeds (below 50 rpm). Excessive heat dissipation due to friction is undesirable as this increases dough stickiness, causing machining (sheeting) and handling issues in the line. Mold inhibitors never replace good manufacturing practices. The best way to extend shelf-life is by following strict pre-requisite programs and having a food safety management system in place. Tortillas made with masa (fresh or dry) usually have a slightly alkaline pH due to nixtamalization. In order to obtain the best functionality of preservatives and mold inhibitors, the pH must be adjusted (lowered) by using acidulants. 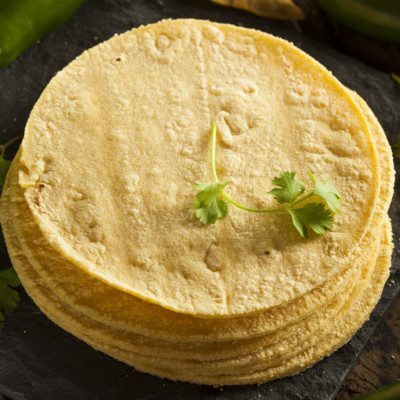 Purchasing dry masa flour or pretreated corn flour can be ideal for small-scale tortilla operations as this supply reduces the need for nixtamalization process, and greatly shortens cleaning and overall cycle times. Similarly, using ready-to-process masa reduces floor space and equipment requirements. It also eliminates waste water disposal problem associated with the nixtamalization steps. Serna-Saldivar, S.O. “Maize: Foods from Maize.” Encyclopedia of Food Grains, 2nd edition, Volume 3: Grain-Based Products and their Processing, Academic Press, Elsevier Ltd., 2016, pp. 106–108. Serna-Saldivar, S.O. “Industrial Production of Maize Tortillas and Snacks.” Wheat Flour and Corn Products, Cereals and Grains Association, AACC International, Inc., 2016, pp. 247–278. Serna-Saldivar, S.O. “Milling of Maize into Lime-Cooked Products.” Cereal Grains: Properties, Processing, and Nutritional Attributes, CRC Press, Taylor & Francis Group, LLC, 2010, pp. 239–254. Rosentrater, K.A. “Other Food Products.” Kent’s Technology of Cereals. An Introduction for Students of Food Science and Agriculture, 5th edition, Woodhead Publishing, Elsevier Ltd., 2018, pp. 711–714.